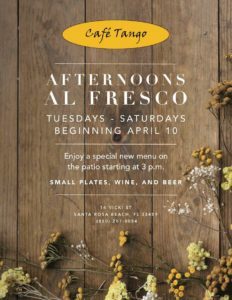 Santa Rosa Beach, FL (March 31, 2018) – Café Tango, located on iconic Scenic Highway 30A, announces the addition of their “Afternoons al Fresco” menu to include tapas, wine, and beer. 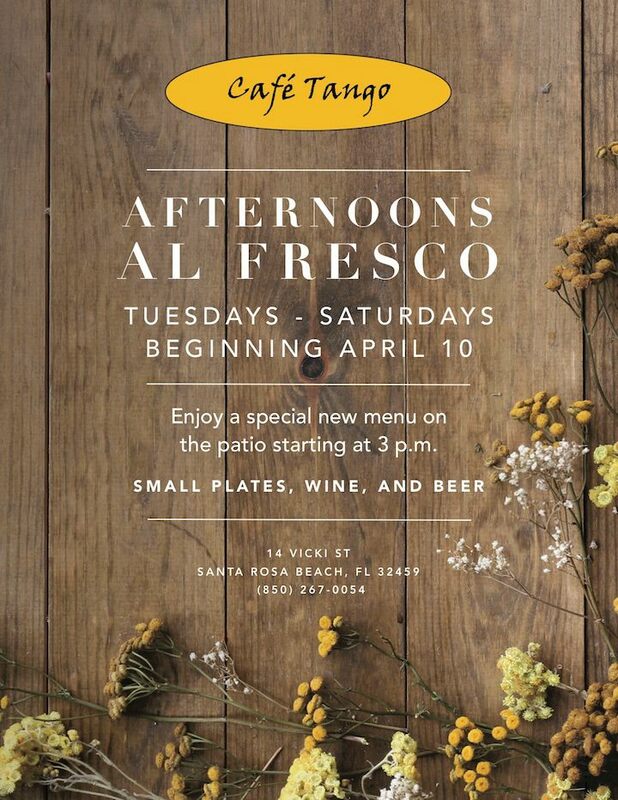 Beginning on April 10, 2018, Café Tango will be adding an afternoon menu featuring Spanish seafood classics, a distinguished wine list and beers. Known for their quaint atmosphere, the well-known restaurant will be serving savory small plates on their outside deck where guests will be able to pair the new selection of tapas, such as spicy shrimp scampi, with notable wines and domestic and imported beers. A plethora of other small plate options, along with a select wine list and beers, will be featured on the menu, including, baked brie, fried oysters cabrales, blackened grouper sandwich, and more. 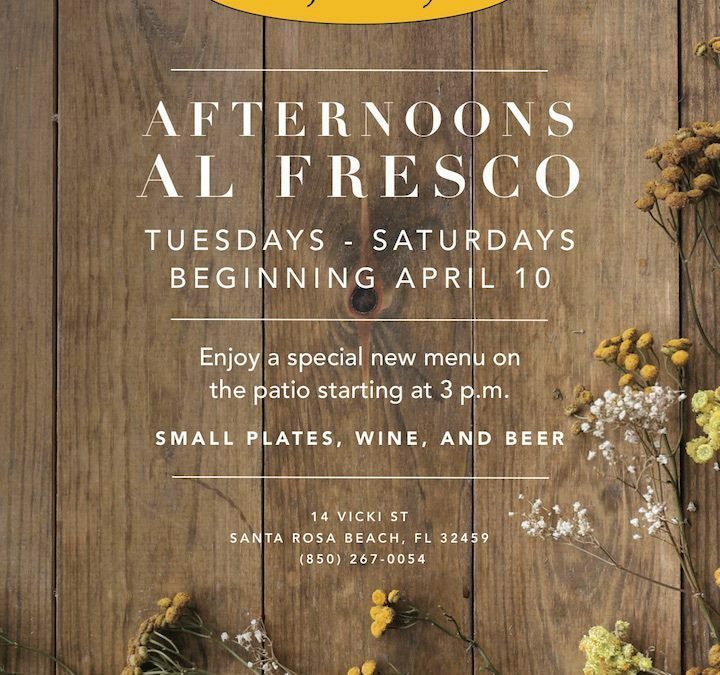 The “Afternoons al Fresco” menu will be available starting at 3 p.m., Tuesdays through Saturdays. Café Tango will be open Tuesday through Saturday for tapas starting at 3 p.m. beginning April 10, 2018 and dinner Tuesday through Sunday at 6 p.m. Although reservations are required for dinner, walk-ins are welcome for Afternoons al Fresco. For more information, please find Café Tango on Facebook, Twitter and Instagram or visit www.cafetango30-a.com. Located in one of the area’s oldest cottages on Scenic Highway 30A in Blue Mountain Beach, Cafe Tango strives to create an intimate and romantic dining experience for its loyal patrons. Father and sons proprietors, Joseph, Patrick and Andrew Morris host a cozy dining room that is all at once relaxed and refined while their European-inspired fare unites fresh, local ingredients to create authentic Spanish and Mediterranean flavors. To learn more about Café Tango, please visit www.cafetango30-a.com or call 850.267.0054.